Daveswordsofwisdom.com: Why a sister is so special. Why a sister is so special. Your sister is always the first female friend you will have in your life. Nobody will ever be able to understand your craziness like your sister and although you don't see each other as much as you'd like, she will always remain your friend and be there for you when you need her the most. While people will come and go in your life, your sister will be in your heart for a lifetime. 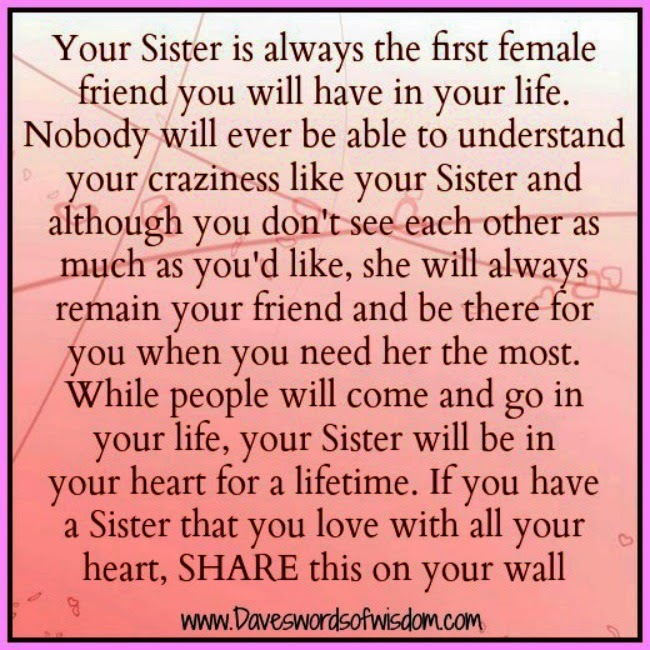 If you have a sister that you love with all your heart, SHARE this on your wall. It's my turn to thank my sister, Wendy Vannortwick Webb. Thanks for your support and being there for me.